Many pubs are struggling. They are closing down for they are unable to attract business. One way we have helped pubs to buck this trend is to install artificial grass in the pub garden. 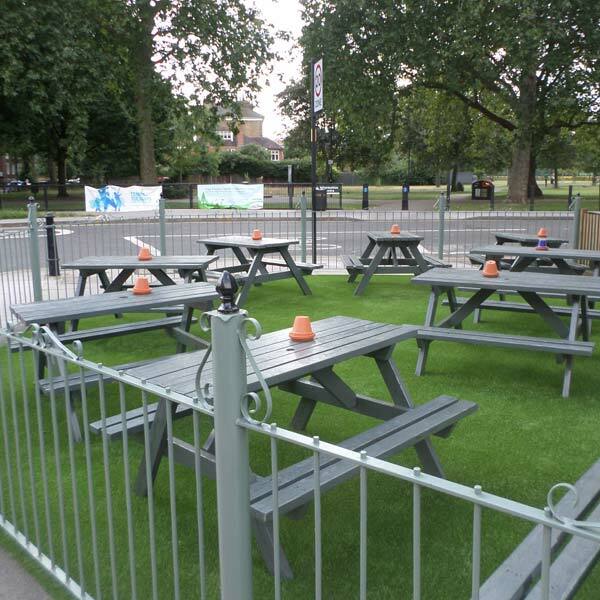 Install our commercial artificial grass in your pub garden and it can be used all year round. (You may want a few heaters in the winter months!). It will provide you with useable extra space on busy days and a place your customers will want to visit. Due to the hard wearing nature of our artificial grass it won’t get worn out and patchy like real grass. You won’t have the problem of mud being brought in to the pub and the maintenance associated with a real grass garden. The outside area will look great for your customers to enjoy their food and drink whether they visit in January or June. In addition to having a pleasant area for adults to enjoy their food and drink you can also opt to add a kids play area. Artificial grass is a better option than bark and other playground floorings as it doesn’t can look messy after use. Provide a great playground for the kids to play in and they will be wanting to bring their parents to your pub every week.